Last month we celebrated our three year anniversary. I thought it would be fun to share some traffic data in the form of a picture that tells 2.2 billion words. 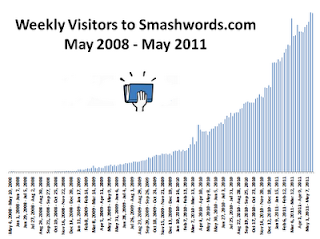 At left is a chart showing weekly traffic to the Smashwords.com web site since May 2008. If you look carefully (click to expand the image), you'll see it's tough to discern the blips for most of 2008. Those were the early days when we were little more than a curiosity. Back in 2008, self-publishing didn't command much respect. It was seen as the publishing option of last resort for failed authors. It wasn't uncommon back then for me to receive emails from previously print-published authors who'd write, "Do you think I'm nuts? There's no way I'm going to allow my work to appear alongside these amateurs." I don't receive those emails anymore. I founded Smashwords with the firm conviction there's a vast human potential trapped inside the minds and fingertips of unpublished writers. I thought if we could provide the enabling tools to help writers unleash their potential upon the world - to be judged by readers - that great things could happen. Today, great things are happening. Indie authors are inching up the best-seller lists, and their success inspires the next wave to go indie. Yet commercial success and the promise or potential thereof is not the primary driver for the indie revolution. Writers write for reasons different than publishers publish. More writers will write, more will publish, and more will bypass publishers to connect directly to readers. Big Publishers will become an afterthought in the minds of tomorrow's indie author. The publishing industry has no clue what's about to happen. Talk to any Smashwords author or publisher, especially those who were once worked with New York, and they'll tell you where things are headed. A forest fire is about to consume the dead wood, and out of the ashes will spring forth a new and vibrant publishing ecosystem offering unprecedented diversity of literary riches more magnificent than anything ever imagined. This is inevitable. In fact, it's already happening at Smashwords and our retail distribution partners Apple, Sony, Barnes & Noble, Kobo and Diesel. It's what happens when writers are given the freedom to publish on their own terms, and readers are given the freedom to read what they like. It represents the inevitable progression of human intention enabled by the Internet revolution. The genie of human potential has escaped the bottle. You, my dear indie author or publisher, will write the next chapter. Fantastic! Smashwords has come such a long way :) I remember when I published my first book in 2009, the paper back was my major concern and all other formats were secondary. It's now the other way around. You continue to inspire me! A tremendous post, thank you so very much! Mark - thanks to you and the SW team for all you've done to vanquish the publishing royals. Their castle lies in ruins. I'm (still) a small fish, but my sales on SW direct have gone way up - especially lately - just as the chart shows. Have any of the royals tried to hire you yet? It'd be the ultimate attempt to conquer by hiring the competition. I'm another author who appreciates what Smashwords offers. I've put up my back list, and just recently bypassed the publisher for one of my series books, preferring to make it available before their earliest slot--somewhere in 2013 or 14. Awesome graph. I wish the stock exchange graphs spiked like that. So, there you are Mark, you started the revolution/evolution in ebook publishing and all us indie authors support you. Like your graph the sky has no limits in ebook publishing. Very good. You said it well, Mark, when you said, " It's what happens when writers are given the freedom to publish on their own terms, and readers are given the freedom to read what they like. It represents the inevitable progression of human intention enabled by the Internet revolution." I have been saying for some time now that I love the freedom of self-publishing, whether it is my new books, or backlist books. It feels darn good. I love the results and thank you for what you have done for a great many people through your vision. If the counter was an old analog one with hands like a clock, you could use it as a fan! Umm... just to play devil's advocate here... when you look at today's NYT list of best-selling fiction e-books, every single one of them is published by a major NY publisher. More important than the NYT list, the retailer best-seller lists offer insight for where things are headed. The retailer's maintain literally hundreds of best-seller lists if you drill down by category. Many indie authors are scaling these lists. At least a couple Smashwords authors (Ruth Ann Nordin and Julie Ortolon) have hit #1 in Romance at Apple, for example. At Kobo, the #2 book in their Today's Top 50 bestsellers as of this moment is John Locke's SAVING RACHEL, supplied by Smashwords. He also holds the #19 spot with WISH LIST. If I'm not mistaken, I think he previously graced the NYT list as well. To be fair, best-sellers are not the norm for any book, but it's not difficult to find instances where indies are out-competing big publishers. It's interesting to look at the economics. Take Tina Fey's book, a best-seller selling for about $13.00. At $13, assuming Ms. Fey is earning the standard 25% net, she's earning a royalty of about $2.21 (13*.25*.7[assuming her publisher is on agency and working direct with retailers]), or about $1.88 after agent fees. To earn the same $1.88 with a Smashwords-distributed book, an indie can price at $3.13. Indies have incredible pricing power against Big Publishers, and for books of equal quality, the playing field is titled in the indie's favor. Tina Fey could go indie with her next book, and at $13 would earn $7.80, or if she let her agent manage the publishing process, she'd earn a respectable $6.61, or 2X her current. Which way should Tina and others go? Very nice post, Mark. I agree with you 100%. When I heard the term 'slush pile' from a Traditional Publisher, I knew then that something was wrong with the process. Thank you for offering this successful fix. Authors aren't the only ones to benefit. Readers now have such a bigger selection, it's a win-win scenario for us all. @canfix, the y axis shows the timeline. The x-axis excludes numbers deliberately. As a private company, we don't disclose exact traffic numbers for competitive reasons. However, we do disclose more data than just about anyone, and we've never disclosed this data, so you're free to interpret it as you like. Amazing growth. I for one don't think paper books will ever go away, but they said that about papyrus rolls! Most of my sales occur on Amazon, with a few on B&N, and only a rare sale on SW. I'd sure like to know the reader exposure (hits) on each venue. 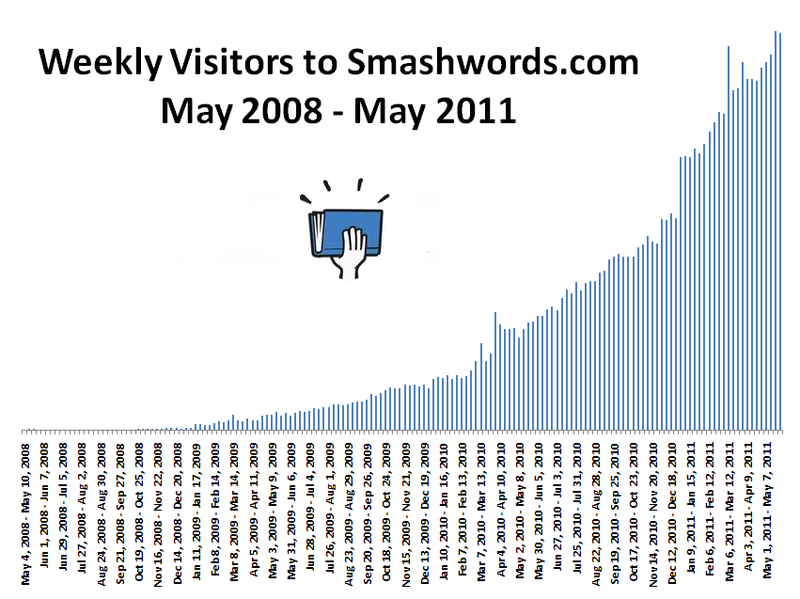 The graph is brilliant and so is smashwords. I feel liberated now that I can concentrate on writing and publishing myself through smashwords. Trying to attract the attention of a traditional agent or publisher was soul destroying. The graph is amazing and looks to be headed nearly straight vertically in just a couple more years. As the consensus slowly changes that self-publishing is not a last ditch effort, what readers are really calling for are more filtering systems to separate the wheat from the chaff, to find the best Indies and not be burned by the lousy ones. I've got to say, I'm very impressed with what Smashwords has done. After publishing my first book, I can tell you that your website is the easiest of all the self-publishing sites to navigate and most user-friendly. The others don't seem all that concerned with making self-publishing an easy experience for the writer, but Smashwords goes above and beyond. I think you guys are doing indie authors a great service, and I wish you all the best in the future.